Dimebolin hydrochloride (brand name Dimebon) is an antihistamine drug which has been used clinically in Russia since 1983. Research is continuing in both Russia and western nations into potential applications as a neuroprotective and potential nootropic. 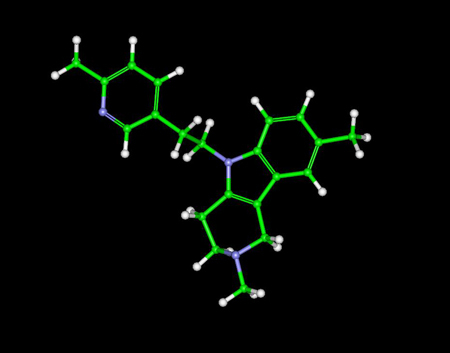 It is an orally active small molecule that has been shown to inhibit brain cell death in preclinical studies of Alzheimer's disease and Huntington's disease, making it a potential treatment for these and other neurodegenerative diseases. Research suggests that it may also have cognition-enhancing effects in healthy individuals, in the absence of neurodegenerative disease pathology. On July 2009 Pfizer and Medivation announced that latrepirdine will be the proposed international nonproprietary name for Dimebon for the treatment of Alzheimer's. Dimebolin appears to operate through multiple mechanisms of action, both blocking the action of neurotoxic beta-amyloid proteins and inhibiting L-type calcium channels, modulating the action of AMPA and NMDA glutamate receptors, and may exert a neuroprotective effect by blocking a novel target that involves mitochondrial pores, which are believed to play a role in the cell death that is associated with neurodegenerative diseases and the aging process. It also blocks a number of other receptors including alpha-Adrenergic receptors and the serotonin receptor subtypes 5-HT2C, 5-HT5A and 5-HT6. Matveeva IA (July-August 1983). "Action of dimebon on histamine receptors" (in Russian). Farmakologiia i Toksikologiia 46 (4): 27-29. Shevtsova EF, Kireeva EG, Bachurin SO (2005). "Mitochondria as the target for neuroprotectors" (in Russian). Vestnik Rossiiskoi Akademii Meditsinskikh Nauk (9): 13-17. Bachurin S, Bukatina E, Lermontova N, Tkachenko S, Afanasiev A, Grigoriev V, Grigorieva I, Ivanov Y, Sablin S, Zefirov N (June 2001). "Antihistamine agent Dimebon as a novel neuroprotector and a cognition enhancer". Annals of the New York Academy of Sciences (939): 425-435. Lermontova NN, Lukoyanov NV, Serkova TP, Lukoyanova EA, Bachurin SO (June 2000). "Dimebon improves learning in animals with experimental Alzheimer's disease". Bulletin of Experimental Biology and Medicine 129 (6): 544â€“546. "Antihistamine Shows Promise in Treating Alzheimers". New York Times. 2007-06-11. Phend Crystal, Jasmer Robert (2008-07-17). "Old Antihistamine Pops Up as Potential Alzheimer's Therapy". Medpage Today. http://www.medpagetoday.com/Geriatrics/AlzheimersDisease/tb/10174. Doody Rachelle S et al (2008-07-19). "Effect of dimebon on cognition, activities of daily living, behaviour, and global function in patients with mild-to-moderate Alzheimer's disease: A randomised, double-blind, placebo-controlled study". Lancet 372: 207-215.
http://www.reuters.com/article/pressRelease/idUS117499+15-Apr-2009+PRN20090415 "Pfizer and Medivation Initiate Phase 3 Trial of Dimebon Added to Donepezil in Patients with Alzheimer's Disease"
Pfizer Inc. (2009-07-30). "Pfizer And Medivation Initiate Phase 3 Trial Of Dimebon In Patients With Huntington Disease". Press release. http://newsblaze.com/story/2009073005345800002.bw/topstory.html. Retrieved July 31, 2009. Lermontova NN, Redkozubov AE, Shevtsova EF, Serkova TP, Kireeva EG, Bachurin SO (November 2001). "Dimebon and tacrine inhibit neurotoxic action of beta-amyloid in culture and block L-type Ca(2+) channels". Bulletin of Experimental Biology and Medicine 132 (5): 1079-1083. Grigorev VV, Dranyi OA, Bachurin SO (November 2003). "Comparative study of action mechanisms of dimebon and memantine on AMPA- and NMDA-subtypes glutamate receptors in rat cerebral neurons". Bull Exp Biol Med 136 (5): 474-477. Bachurin SO, Shevtsova EP, Kireeva EG, Oxenkrug GF, Sablin SO (May 2003). "Mitochondria as a target for neurotoxins and neuroprotective agents". Annals of the New York Academy of Sciences 993: 334-344. "Medivation's Dimebon(TM) Maintains Statistically Significant Benefit on All Five Efficacy Endpoints in Alzheimer's Disease Trial After One Year of Therapy". Press release. 2007-06-11. http://www.prnewswire.com/cgi-bin/stories.pl?ACCT=104&STORY=/www/story/06-11-2007/0004605280&EDATE=. Wu J, Li Q, Bezprozvanny I. Evaluation of Dimebon in cellular model of Huntington's disease. Molecular Neurodegeneration. 2008 Oct 21;3-15.